I’ve just now gotten off a plane flying to Queensland from Sydney. What was surprising about this trip was the excellent customer service my wife and I received from our Customer Service Officer Michael Gerber [no, not THAT Michael Gerber]. Michael was efficient and courteous with everything that he did for Jayne and me during the flight. Without being over the top and without ever going missing in action. One of my big gripes with flight crew is that they are often unattentive when it comes to looking after the needs of their passengers. Unattentive flight crew usually have to be summoned by the “call light button” because they are too busy doing not much else at all. Instead of looking after their customers. When Michael brought the lunch trolley around, I chose to abstain from a meal, preferring a snack and an adult beverage instead. Shortly after, when Michael checked in with me and asked whether I needed anything else, I let him know that I was fine, but I would be in need of a second beverage later on during the short flight. Michael said that he’d be right onto that once he’d finished serving the lunches in our cabin. And sure enough, on cue, without having to ask or press the button, just as I was finishing my first beverage, Michael appeared with a fresh glass and a second beverage for me without havering to be asked. Anticipation is one of the key factors in ensuring that you provide World Class Customer Service. When you are at your dental surgery, are you anticipating the needs of your customers? How can you “surprise” and AMAZE your patients and customers with Above and Beyond Service experiences? Can you greet them by name as they enter your office before they have time to introduce themselves? Even if they are visiting your practice for the very first time? There are a multitude of opportunities around the dental office to truly deliver World Class Dental Customer Service. If you just take the time to look out for them…. And guess what, when you do, and you provide that great service to your unsuspecting customers, you’ll create raving fans for your dental office. And really, that’s not too difficult to do. 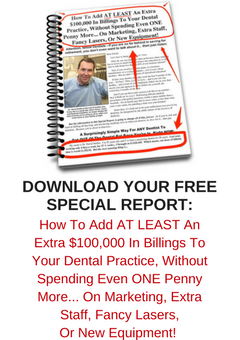 Because not too many other dental offices out there are really trying to do this….